So what to do when house-bound during a long Minnesota winter? Well, I have been trying to put into practice tips that, as a dietitian, I share in various DAHLC nutrition/culinary offerings. One such tip is to take time to organize your kitchen. So on a frigid weekend day, I took time to thoroughly clean the refrigerator. Next, I tackled the drawer with the storage containers – tossing out several plastic containers with no matching lids. I ended the day by taking inventory of staple foods, those foods that I want readily available for simple meals! Although the list of staple foods varies per household, common ones are: 1) packaged whole grains such as quinoa, brown rice, whole wheat pasta; 2) canned beans, tomatoes, and chicken, beef, or vegetable stock – look for lower sodium brands; 3) dried fruit or canned fruit without sugar or syrups; 4) nuts and canned tuna provide quick protein sources (and other nutrients); and 5) don’t forget the freezer staples – frozen fruits and vegetables make for quick healthy meals and/or snacks. 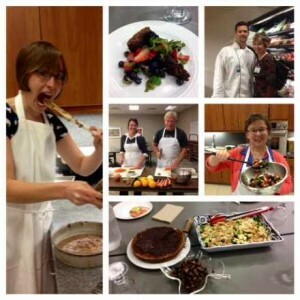 GET COOKING: A hands-on cooking class held in DAHLC's demonstration kitchen. A different topic/technique will be discussed in each class: https://dahlc.mayoclinic.org/discussion/get-cooking. Overcome cabin fever by eating well!